Most of the broad range of attendees - from Maryland Department of Environment, Maryland Energy Administration, The Chesapeake Bay Foundation, The Nature Conservancy, World Resources Institute, and more - work on land-use management but might not regularly think about new technologies or policy innovation like the NASA Carbon Monitoring System (CMS) technology developed at the university, which was the focus of conversation. “I applaud the University of Maryland for creating a venue for a diverse set of stakeholders to come together to discuss this potentially game-changing new tool and how it can be used to mitigate the impact of climate change and to assess the relative effectiveness of different types of actions on sustainability,” continued Treasurer Kopp. 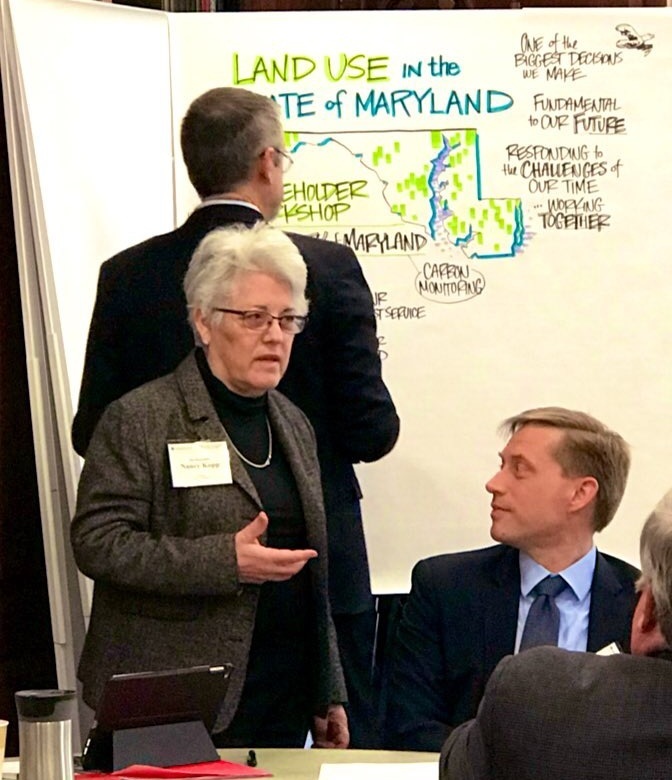 The State of Maryland, through the Department of Natural Resources, serves as a pilot for applying this technology and already uses this data to inform several climate mitigation goals defined by the Greenhouse Gas Reduction Act (GGRA) Plan. Following a presentation on the current status of the science, the convening participants agreed that there is much potential for other innovative uses across the private and public sector. Dr. George Hurtt, Professor and Research Director for the UMD Department of Geographical Sciences and Science Team Leader for NASA CMS, emphasized the potential for stakeholders in the state to use a new high-resolution carbon monitoring system to inform climate-smart land-use decision making. Participants raised how public-private partnerships could inspire new initiatives which help bolster existing goals and drive further ambition. CGS Director Nate Hultman welcoming the group. "CMS could be useful for helping to reduce barriers to verifying carbon sequestration for land-based projects in Maryland. By testing out innovative approaches to verification, we could potentially make carbon credits from local forest management and reforestation projects more cost-competitive with carbon credits from other types of projects that are traditionally easier to measure,” offered Sally DeLeon, Senior Project Manager in the UMD Office of Sustainability. Rachel Lamb, a PhD candidate that works on the CMS project, acknowledged that this science could inform market-based solutions, for example by aiding in the pricing of forest carbon. But there is an opportunity to design a broader, system-based solution with a focus on equitable co-benefits. “Improved land-use planning in service of protecting multiple social and environmental co-benefits, identified at policy-relevant and local scales, provides an opportunity to maximize all the synergies of mitigation and resilience planning,” says Lamb. The workshop participants also noted that opportunities for future work exist in streamlining the data sources and methods used across the sectors to inform carbon accounting in the land-use sector while exploring how climate mitigation and resilience planning can be developed at all levels of government, with the support of market-based solutions. The University, through its Global Sustainability Initiative, supports stakeholder discussions across a variety of topics that touch on energy, climate, and environmental issues of economic interest to the state. And future convenings with these types of unusual players aim expand opportunities to find innovative solutions while creating new sustainable partnerships.